Good things come to those who wait is the saying. Director S.S.Rajamouli has surely made us live that phrase with his latest offering Makkhi. After announcing the film, the director decided to let our imagination run wild when he explained the story was simple. A guy gets reborn to avenge his death and save his girlfriend from the high profile bad guy. A common story that not only Hindi cinema but the entire Indian Film Industry would have tried to depict at least once. But the killer appeal for the audience this time is our guy is reborn as the common house fly. Now are the pieces falling into a tiny sequence in your mind? Intrigue peaked? Trust me when I say this writer went berserk looking out for clippings, promos and the ultimate trailer before this movie (finally!!) released as a bilingual, shot simultaneously in Tamil – Naan Ee and Telugu – Eega. Now having seen the film in Telugu and in Tamil, what would Makkhi, the HINDI dubbed version provide a repeat viewer. The answer? Almost the exact same exhilarating ride as a first time viewer. The effort taken in by the whole team is really hard for anyone to explain in a justifiable manner. 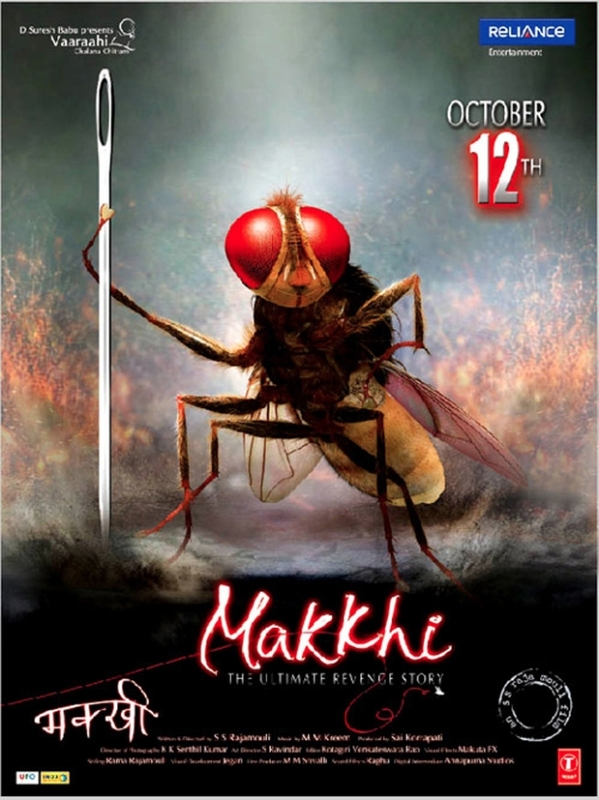 Makkhi must be seen to be believed and experienced in its full capacity. Be it the tender love story of an independent girl, Bindu played by debutant Samantha Ruth Prabhu, who slyly brushes all efforts by her love struck neighbor, Jani played by South actor Nani, although she too feels the same. Or the devilishly suave advances and sinister acts of Sudeep retaining his name for his character that makes you both hate and love him in equal quantity. Or the struggle this bad guy goes through thanks to the little hidden hero that makes his life hell. Love, laugh, smile, smirk, cry or even cringe all you want but know the team of Makkhi , from the actors in front to the VFX behind the magic on screen, are pulling the strings and will make you fall prey to their charm. However a diagnosis is needed, isn’t it? And yes it does start of quite simple. Boy is in love with girl. She loves him too but won’t show. Enter bad guy who lusts after her. He finds out about him and kills boy. But this maybe just 20 minutes of the story and granted it may not seem much but what progress on screen will have you spellbound. As Rajamouli states, this is the ultimate revenge story so clearly that’s where the real fun lies. But if the story doesn’t take your fancy, the actors will surely keep you involved. Hands down, Sudeep takes the lead in the actors. Not only with filmage but also quality of performance. As sinister as he is supposed to be, its the other shades of his character and the fact his opponent is a VFX product AFTER the scene was shot that stands out about him. Nani is only present in the first 20 minutes of the film but he adds to sweet romance in a calm, confident and cute manner. Leading Lady Samantha is someone you will see walking down the street and at the supermarket. No big whistles or horns. Just a simple girl with a special talent. The same, however, cannot be said for her appeal as it hits home harder than the girl next door character she plays. All else are competent. When it comes to a film like this, the visual is half the work. M.M.Kreem brings out the visuals with each scene with his background score making it an electrifying experience while the songs are sure to reach your ears pleasantly with Lava Lava making an interesting mark. Editor Kotagiri Venkateswara Rao keeps the screenplay by S.S.Rajamouli in ship shape, while cinematographer Senthil Kumar makes sure each scene fits the bill, whether its the whirlwind in a glass or the reflective light of a torch. Art director S. Ravindar pulls out the rabbit from a hat on this one. Was I impressed? Was it worth the wait? Did Rajamouli yet again? Clearly a big fat YES to all of the above. Now for the folk in B-Town, the figure that is S.S.Rajamouli is not entirely familiar beyond the news and gossip of his critically and commercially claimed film Magadheera that was at one staged rumored to be remade in Hindi. Maybe few more folks would have known about Son Of Sardaar being a remake of his Maryada Ramanna. But Makkhi is the film that will introduce him to the audience of Hindi cinema, even if it is a dubbed film, and bound to get the fan following that he enjoys in the south with Ajay Devgn and Kajol’s vocal cameo’s standing testament to it . Even the little niggling bits of length don’t stand a chance against his Midas touch.